China View reports that China has passed new medical reform plan. 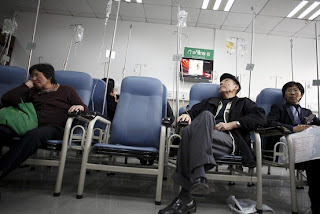 ·China's Cabinet passed a long-awaited medical reform plan. 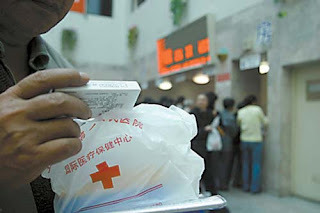 ·The plan promised to spend 850 billion yuan by 2011 to provide universal medical service. ·Measures will be taken to provide basic medical security to all Chinese. BEIJING, Jan. 21 (Xinhua) -- China's State Council, or Cabinet, passed a long awaited medical reform plan which promised to spend 850 billion yuan (123 billion U.S. dollars) by 2011 to provide universal medical service to the country's 1.3 billion population. The plan was studied and passed at Wednesday's executive meeting of the State Council chaired by Premier Wen Jiabao. A) They were distracted by fight again overheating (inflation). According to the reform plan, authorities would take measures within three years to provide basic medical security to all Chinese in urban and rural areas, improve the quality of medical services, and make medical services more accessible and affordable for ordinary people. -- Increase the amount of rural and urban population covered by the basic medical insurance system or the new rural cooperative medical system to at least 90 percent by 2011. Each person covered by the systems would receive an annual subsidy of 120 yuan from 2010. -- Build a basic medicine system that includes a catalogue of necessary drugs produced and distributed under government control and supervision starting from this year [sounds like the FDA]. All medicine included would be covered by medical insurance, and a special administration for the system would be established. -- Improve services of grassroots medical institutions, especially hospitals at county levels, township clinics or those in remote villages, and community health centers in less developed cities. -- Gradually provide equal public health services in both rural and urban areas in the country. -- Launch a pilot program starting from this year to reform public hospitals in terms of their administration, operation and supervision, in order to improve the quality of their services. Government at all levels would invest 850 billion yuan by 2011 in order to carry out the five measures according to preliminary estimates. The meeting said the five measures aimed to provide universal basic medical service to all Chinese citizens, and pave the road for further medical reforms. The meeting also decided to publish a draft amendment to the country's regulation on the administration on travel agencies for public debate. It also ratified a list of experts and scholars who would receive special government allowances. The Wall Street Journal reports that China is planning $124 billion overhaul of health care. SHANGHAI -- China's government said it will spend more than $120 billion over the next three years to repair the nation's health-care system by expanding insurance coverage, revamping public hospitals and improving access to medical treatment. The State Council, the Chinese government's equivalent of a cabinet, which announced the plan Wednesday, said its goal is to extend medical insurance to 90% of the population by 2011 and make "basic health-care services" available to all of China's 1.3 billion citizens. The government intends to improve coverage by increasing subsidies for insurance premiums. Many Chinese have no health insurance, and the country's pay-as-you-go approach often forces people to forgo treatment. The failings of the system have stirred significant discontent, and the overhaul is a response to those social pressures. The loss of state support in the 1980s led hospitals in China to operate as businesses, with a pay-as-you-go approach and a tendency to prescribe treatment that could boost income from patients who often can't afford it. China's government also has an economic incentive. The specter of high medical costs, coupled with China's overall weak social safety net, has discouraged people from spending their money. That has been a drag on efforts by the government to boost domestic consumption and make the economy less reliant on exports for growth. Broad insurance coverage could, over time, start to shift the balance in China away from savings and toward more consumption, economists say. The State Council estimated the total cost of the plan would be 850 billion yuan ($124 billion) over three years. That is equal to about 3% of China's expected 2008 GDP over the three years of the plan, though it is unclear how much of the amount is new spending. "It's definitely a significant commitment of money," said William Hsiao, a Harvard University health economist. As China shifted from central planning to a market economy in the late 1980s, it sharply cut public services, especially in the countryside, and essentially privatized medical care. Hospitals are pressed to operate as for-profit businesses and push drugs and tests in order to boost their income, critics say. In an effort to rein in costs, the government is working to strengthen its control over drug production and distribution to limit the ability of hospitals and doctors to earn money from drug sales and force them to rely upon fees for medical services. Mr. Hsiao cautioned that unless the government is able to address such problems in the hospital system, it won't necessarily lead to the desired improvements in health care. Chinese government spending on health in 2006 amounted to less than 1% of the country's gross domestic product, ranking China 156th out of 196 countries surveyed, according to the World Health Organization, the United Nations' public-health arm. According to the U.N., nearly 50% of health-care costs are borne by individuals, about 18% by the government and roughly 33% by various types of insurance. Government health-care spending has also been distributed unevenly, according to the U.N. In 2005, it says, 25% of public-health resources were devoted to rural residents, even though they made up roughly 60% of the population. The State Council said it intends to close this urban-rural gap. 1) Chinese government spending on health in 2006 amounted to less than 1% of the country's gross domestic product, ranking China 156th out of 196 countries surveyed. 2) The specter of high medical costs, coupled with China's overall weak social safety net, has discouraged people from spending their money. 4) Medical reforms have been deliberated by authorities since 2006. China's battle with inflation took priority over reforms of its social safety net. 5) Now with the inflation threat temporarily faded, China is finally moving forwards with all these reforms and improvements to its social safety net. China reforms of its social security and medical programs will encourage spending and create inflationary pressure. However, when inflation returns in the next few months, authorities will be hard pressed to back out of these announced reforms of its social safety net. Dropping the dollar peg will be a much more politically palpable alternative.